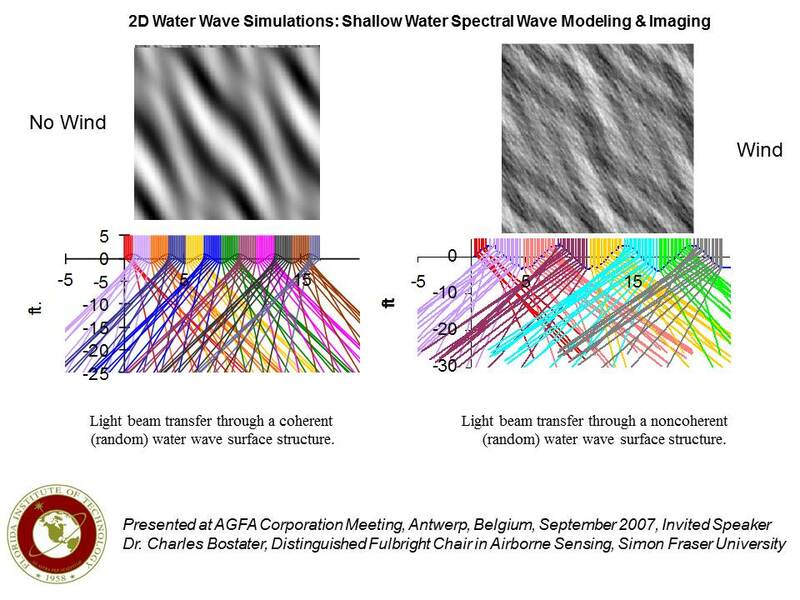 Note lack of water waves in order to improve subsurface feature & object detection. Note Influence of water waves on ~1 meter GSD pixels. 3. 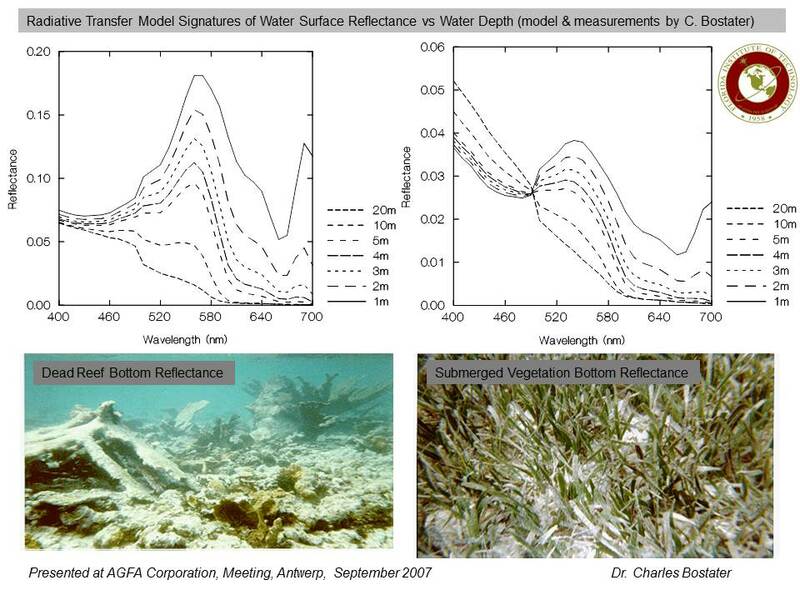 Modeled Low Altitude Hyperspectral Signatures of SAV and Coral Bottom with Changing Water Depths. 4 . Low Altitude Hyperspectral and Digital Multispectral Image of Indian River Lagoon, Florida. 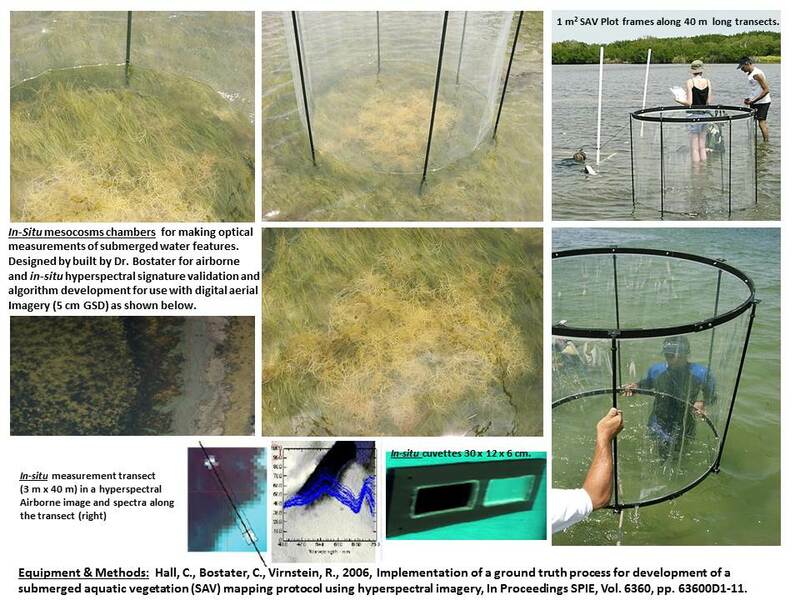 Research concerning wave field characteristics on water surface reflectance for SAV and Water quality detection. 7. 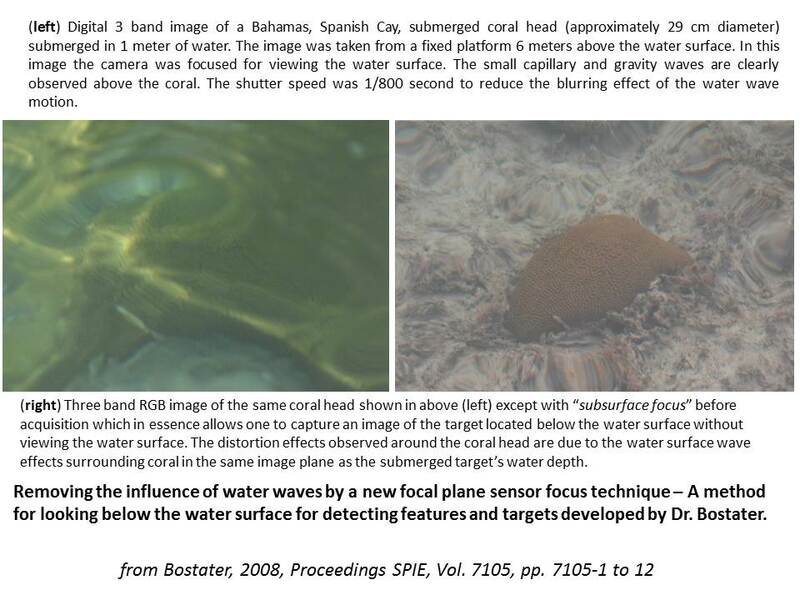 Demonstration of a method to remove the influence of water surface waves for subsurface feature and object detection. 8. 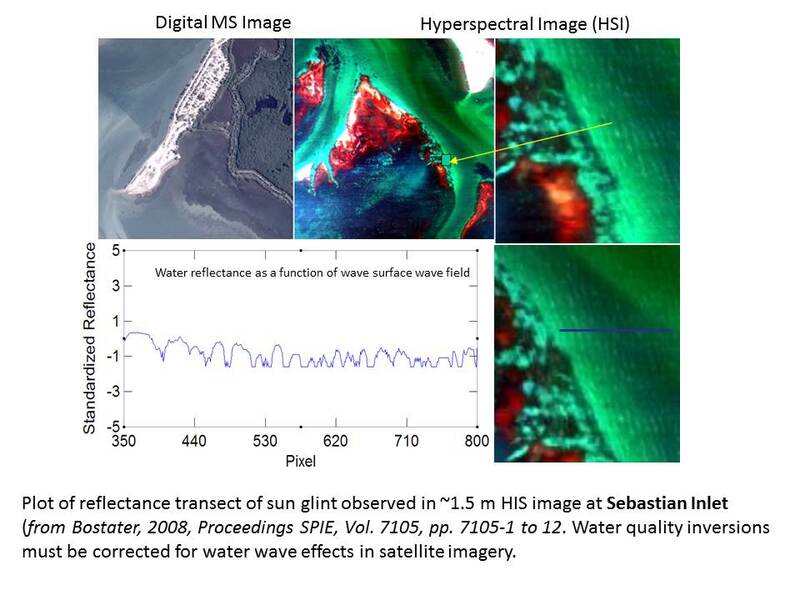 Banana River shoreline monitoring from small vessels using multispsectral and hyperspectral imagers. 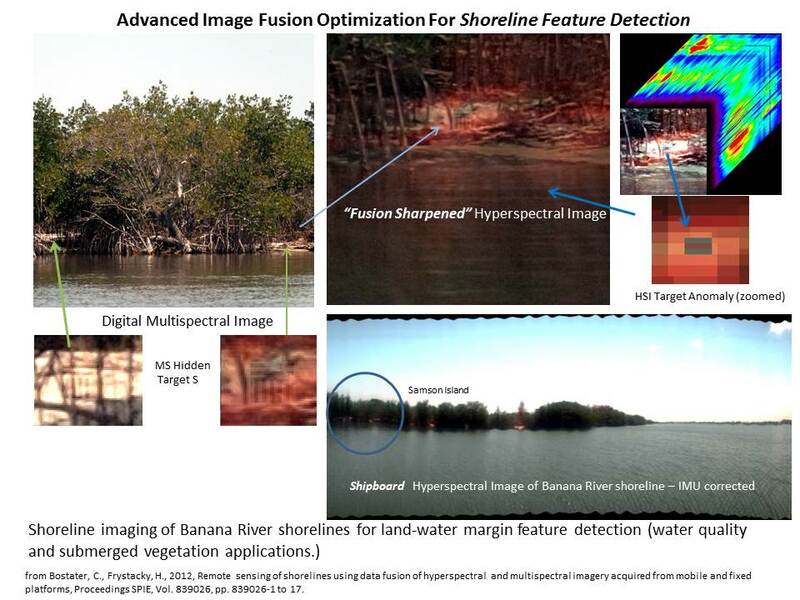 > Demonstration of image data fusion optimaztion for feature and target detection on or nearby shorelines and littoral zones. 9. 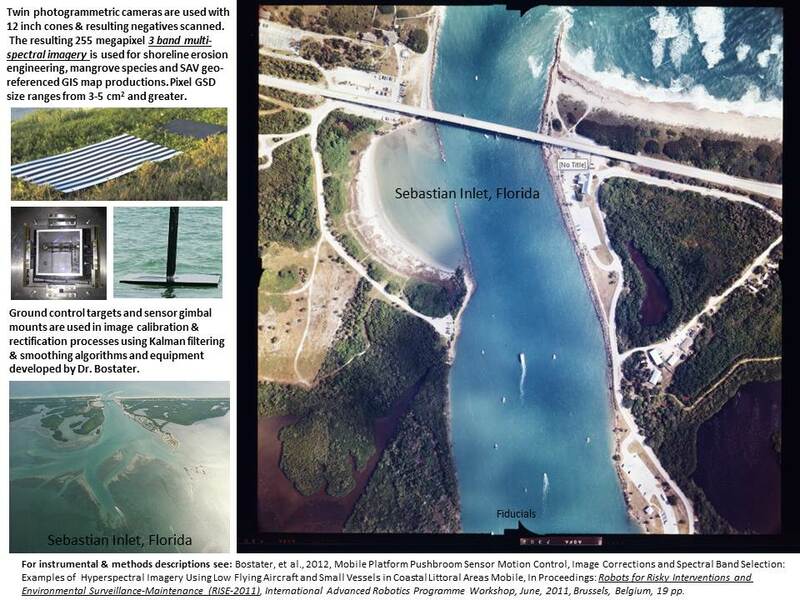 Sebastian Inlet, Florida - multispectral 255 megapixel airborne imagery, ground targets and camera mount. > Example vertical photogrammetric digital multispectral image and ground control targets for engineering and mapping applications. > Example ground validation methods and instruments. > NASA Innovative Technology Award was earned for this project. > Spectra and image showing High Chlorophyll Biomass in northern Indian River Lagoon waters. > Schematic showing instrument signal Kalman Filter & Smoothing techniques. > Schematic showing example of airborne instruments used. 15. Digital Multispectral Airborne Photogrammetric Image (~255 megapixel) over Eau Gallie Causeway, Central Indian River Lagoon, Florida. > Indian River Lagoon: example of airborne MS photography. 16. Hyperspectral Imaging Equipment: System Design description for Pushbroom imager built by Dr. Bostater. > Computer Screenshot and Equipment Systems Design.